Get inspired for your country Christmas decorating this year with these ideas that include all things vintage and rustic. Whether you are decorating inside or out, you will find lots of ideas to warm up your space. A vintage inspired sign along with rustic accessories warm up a bar area for the holidays. Things like antlers to hold an ice bucket or an old branch planter to hold wine tend to create a comfortable space to entertain guests. 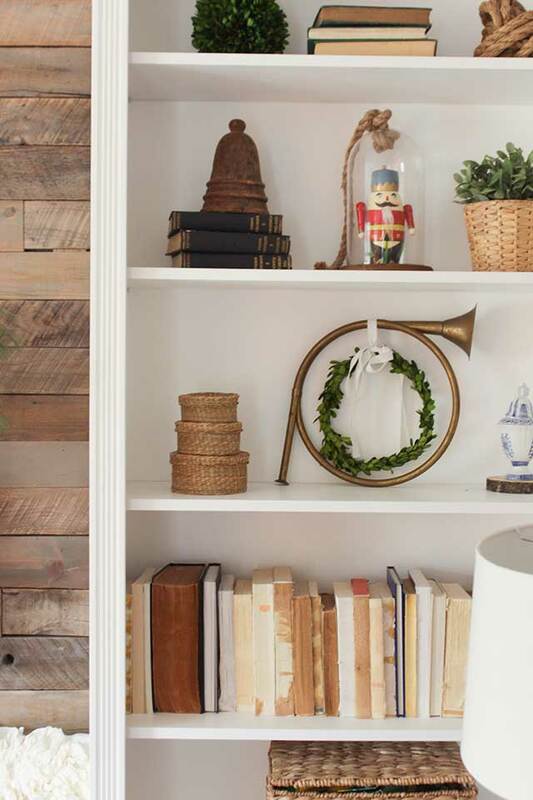 A vintage brass horn is perfect for hanging a small boxwood wreath from. It’s a simple look that screams country Christmas. Plus, the nutcracker displayed in the rustic cloche adds even more warm nostalgia. 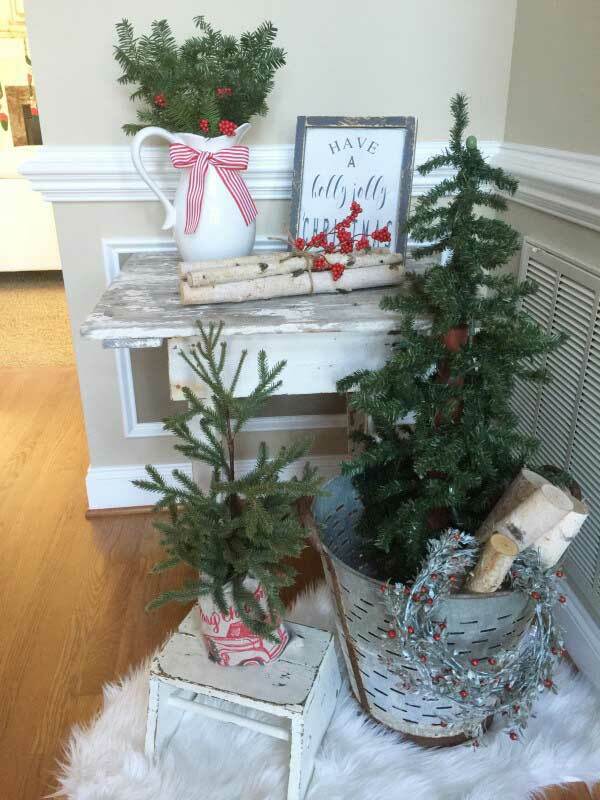 Birch logs are a favorite rustic element to decorate with. For Christmas decorating, wrapping a bundle of birch logs with twine and red berries is a perfect warm accessory. 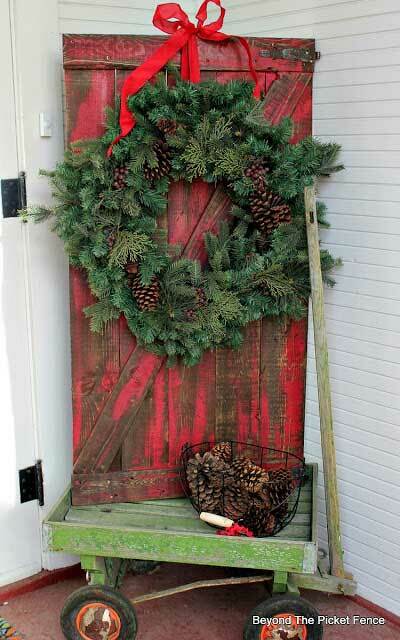 Galvanized buckets are also popular in rustic Christmas decorating. They can be filled with greenery, logs, or other Christmas decor. 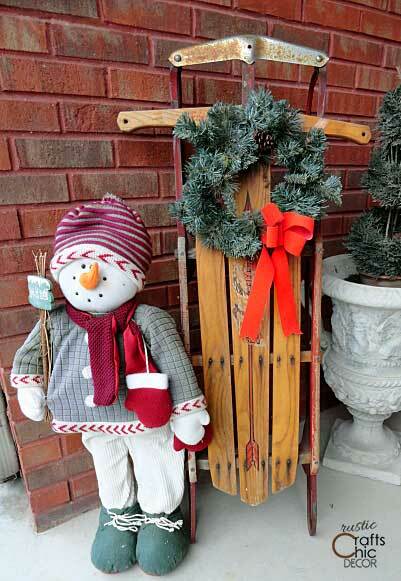 A vintage sled adds lots of country warmth to a front porch. It also makes a great back drop for a Christmas wreath or other decorations. Besides sleds, wagons also make warm accessories for the front porch. Either an old green wagon, like this, or a vintage red Radio Flyer are perfect for Christmas time. This outdoor area has it all! 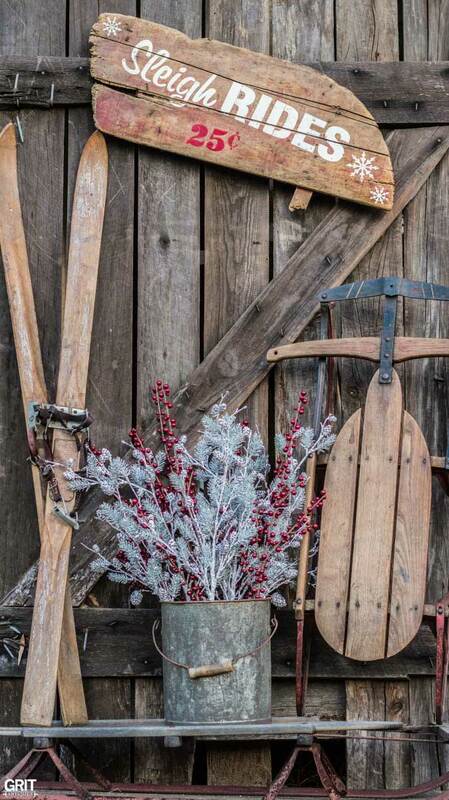 Vintage sleds, old skiis, a galvanized bucket, and a cute handmade Christmas sign create the perfect setting for a country Christmas. What ways do you like to warm up your Christmas decorating? Do you incorporate some worn vintage items or natural rustic accessories? Feel free to share your thoughts and ideas! I love it–where did you get the Reflect and Unwind signs? I bought those a few years ago from a shop in Traverse City, MI—-I can’t think of the name now unfortunately. Hello where did you get the cheers sign from? 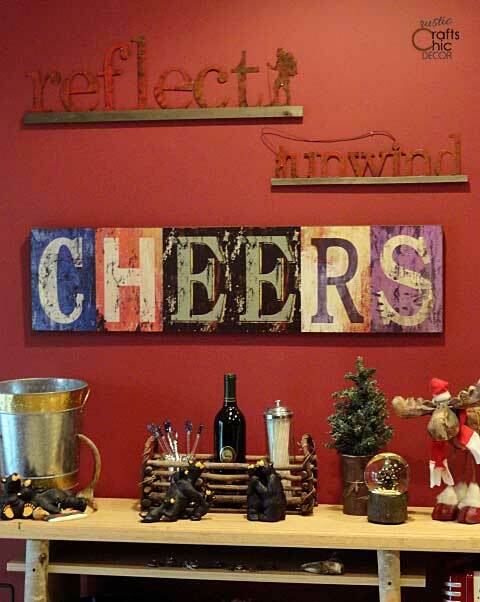 The cheers sign was from Pier One Imports.